· Before the convention officially began Wednesday night, 15 people participated Tuesday and Wednesday in the Emerging Leaders Institute of the American Society of News Editors. ASNE has determined that in order for its diversity goals to be met — parity of journalists of color with their counterparts in the general population — journalists of color must be in leadership positions. · The Detroit Metro Convention & Visitors Bureau estimated that the convention would generate almost $11 million in direct spending, Michael H. Hodges reported July 30 for the Detroit News. Mayor Mike Duggan, in remarks at Wednesday’s opening ceremony, noted that Detroit’s WGPR-TV was the nation’s first African American-owned television station, and cited the city’s rich black journalism tradition, naming practitioners such as Angelo Henderson, Stephen Henderson, Robert McGruder and Sam Logan, as well as the Michigan Chronicle newspaper. · In one of the most popular workshops, “Tyler Perry Master Class: Entrepreneurship and Branding,” the film and television producer “focused on monetizing black culture and cultivating ownership,“ Arielle Brumfield reported for the NABJ Monitor, the convention news organ. “Too many of us have operated as workers and not owners,” CBS News reporter DeMarco Morgan said at the Friday session. The Perry workshop sucked some of the air out of the convention space, overlapping with nine other workshops and the organization’s business meeting, which, as in the past, ran over its scheduled time. · A well-produced tribute to Les Payne, the NABJ co-founder, fourth NABJ president and retired columnist and news manager at Newsday who died in March, included a never-seen video by longtime member Sheila Brooks from 2009 in which veteran journalist Warren Bell interviewed Payne. In it, Payne praised NABJ’s bylaw, which would be repealed in 2014 by members in a constitutional amendment, that the NABJ president serve only one term. The rule gives more black journalists training in leadership skills and helps remove the psychological sense of inferiority that African Americans can develop in a white-dominated society, Payne said. When the video concluded, current NABJ president Sarah Glover, the first allowed to serve two terms since NABJ’s 1975 founding, said she hoped she made Payne proud. · In another celebrity attraction, singer Bobby Brown appeared at a promotion of “The Bobby Brown Story, Powered by BET Networks” (video). · The topic of a “New Detroit,” job opportunities, inclusiveness and the issue of the city’s use of public funds to rebuild downtown were boiling points for attendees of a two-hour town hall meeting hosted by NABJ’s Detroit chapter on Tuesday, Sierra Porter reported Thursday for the NABJ Monitor. · Anchor Mike Woolfolk of WEYI/WSMH AM, serving Flint and Saginaw, Mich., tweeted Friday: “Look who’s at #NABJ picking the brains of our #JSHOP [High School Journalism Workshop] students? Yes, that’s @chancetherapper LEARNING from our high school students and sharing some knowledge back! Informal and off the record. He also met with a few pros! . . .” Anchor Erica Simon of KTRK-TV in Houston added, “I think it’s cool how @chancetherapper is attending #NABJ18 for the workshops just like us. IMO: the great only stay great by constantly sharpening their skills and learning from others.” Last month, Chance bought the local news site Chicagoist. · The convention was a financial success, Executive Director Drew Berry said at the Friday business meeting. Sponsorships netted $235,000 more than budgeted projections, and registrations took in an extra $270,000. Finance Chairman Gregory H. Lee Jr., a former NABJ president, said the association was $473,134 in the black. · The membership approved a motion from the Washington Post’s Vanessa Williams, a former NABJ president, that would prevent members who work under contract for NABJ from simultaneously holding NABJ membership. Williams said that might create a conflict of interest when certain issues are presented for a vote. Executive Director Drew Berry told Journal-isms later that the rule would affect 10 to 15 people and that he was not concerned. · The organization’s most tumultuous event over the last year, the resignation of Executive Director Sharon Toomer, who had written a blistering letter criticizing board members’ conduct, was not mentioned during the business meeting. · Nikole Hannah-Jones, New York Times Magazine reporter and co-founder of the Ida B. WellsSociety for Investigative Reporting, tweeted, “Standing room only for the @IBWellsSociety investigative reporting boot camp at #nabj18. Don’t tell me journalists of color can’t and won’t do this work!” At a reception hosted by the Atlantic magazine, the year-old society, whose mission is to increase the ranks, retention and profile of investigative reporters and editors of color, announced new quarters at the Joan Shorenstein Center on Media, Politics and Public Policy at Harvard University. Setti Warren, former mayor of Newton, Mass., and an African American, was introduced as executive director of the center. Warren, a recent Democratic gubernatorial candidate, said he was excited about working with co-founders Ron Nixon of the New York Times and Hannah-Jones. 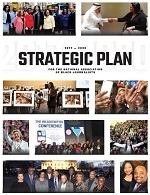 · Five black female business owners told a panel Wednesday “that winning respect can be so difficult that they sometimes bring along a white colleague to important meetings with investors or others just to make things go easier,” John Gallagher reported for the Detroit Free Press. 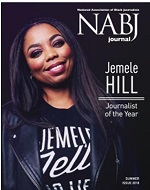 · Jemele Hill of ESPN talked only indirectly about the controversies involving her tweets about President Trump’s belief in white supremacy as she accepted NABJ’s “Journalist of the Year” award Saturday, preferring to thank those who helped her as her career advanced. But at an earlier session, she was presented with a painting depicting her in front of the American flag. The artist is Eric Millikin. He and Hill worked together at the State News, their college paper at Michigan State. · April Ryan of American Urban Radio Networks, last year’s Journalist of the Year and a White House correspondent who has clashed with President Trump’s press secretaries, contributed a videotaped introduction to Hill’s award. “Be strong my sister, because they are going to come after you like they came after me,” Ryan said. · In NABJ elections, no candidates came forward to represent regions II (the Midwest), and IV (the West). In contested races, Khorri Atkinson, reporter at Axios in Washington, D.C., was elected parliamentarian, defeating Ernest Owens, LGBTQ editor and columnist for Philadelphia Magazine, 265 to 121. However, a tie for media-related representative sets the stage for a special election to be held from Aug. 13 to 20, NABJ President Sarah Glover confirmed on Tuesday. Terry Allen, CEO of 1016 Media and a senior account executive for FedEx Services, and Tanzi West Barbour, chief communications officer of the Wayfinder Foundation, the incumbent, each received 31 votes. Seventeen were cast for Haniyyah Sharpe-Brown, who dropped out of the race. Candidates forum (video). Announcement of winners (video). · On a similar panel on Trump and the First Amendment sponsored by the Media Law Resource Center, panelists decided the best response was to do a good job as a journalist, according to George Freeman, executive director. However, Freeman told Journal-isms by telephone on Monday that because local news outlets have more credibility with consumers than national ones, he believes that local media might help bridge the gap between media organizations and skeptical citizens. They might hold town halls, for example. Writing Sunday for the Washington Post, Margaret Sullivan made a similar point. “Last year when I visited Luzerne County in Pennsylvania to talk to people about their media habits, I was most struck by one thing: The allegiance to local news outlets — the two competing papers in Wilkes-Barre, and the popular ABC affiliate, WNEP, or Channel 16 as everyone called it,” she wrote. · Director Spike Lee previewed his new “BlackKkKlansman” movie at the Detroit Institute of Arts. The movie opens Aug. 10. Lee took questions along with the movie’s star, John David Washington, son of Denzel Washington. The true story of a black cop who infiltrates the Ku Klux Klan debuted to raves this year at the Cannes Film Festival. In a question-and-answer session, Lee said, “I’ve been saying these two words since ‘School Daze’ in 1987 — ‘Wake Up.’ The first two words in ‘Do the Right Thing’ were ‘wake up.’ Those two words are important today. As the young people say, ‘Get woke. Stay woke.’ ” Lee said he was “100 percent behind” Jemele Hill, who criticized Trump as a white supremacist, and said more African Americans should aspire to work behind the cameras. · A Thursday panel, “Detroit Basketball: Then and Now” included former star players Isiah Thomas, Spencer Haywood and Steve Smith, and former Detroit News writer Vincent Goodwill. “Goodwill and Smith, both Detroit Pershing High School grads, beamed with pride as they talked about Haywood (also a Pershing alum) and his accomplishments. Haywood’s historic 1971 Supreme Court case ended the NBA rule that barred players from being drafted into the league until four years after their high school graduation. . . .,” NABJ recalled. Haywood is now chairman of the board of directors for the National Basketball Retired Players Association, which is receiving “over $15 million a year” from players LeBron James, Steph Curry, Dwyane Wade and Kevin Durant “to get all of us the same health insurance that they have!,” Haywood told USA Today. · Spencer Haywood was among six people who received Sam Lacy Pioneer Awards Friday from the NABJ Sports Task Force. Others were Brenda Gatlin, the first women’s coach in Michigan to also coach a boys high school team and the first woman to be inducted into the Detroit Basketball Coaches Hall of Fame; Jimmy Raye II, who at Michigan State in 1966 became the first black quarterback from the South to lead his team to a national football championship; Willie Horton, a seven-time All-Star in his 17-year career in major league baseball through the 1960s and into the 1970s, mostly with the Detroit Tigers; Lowell Perry, wide receiver and safety for the University of Michigan football team who became the NFL’s first African American assistant coach in 1957 with Pittsburgh. Nine years later, he became the first African American TV analyst to broadcast an NFL game to a national audience. Rob Parker, a Detroit journalist for 20 years, was the Sports Task Force’s Journalist of the Year. · The Sports Task Force had seven task force-themed workshops and panel discussions, its most ever. · NABJ-Chicago was named the NABJ Professional Chapter of the Year and North Carolina A&T State University was Student Chapter of the Year. · “Downtown Detroit landmarks were the backdrop Saturday for the #NABJ18 Motor City 5K Run, Walk, Bike Powered by FCA US. . . . The 5K Run/Walk and 7.3-mile bike ride started at Hart Plaza, moved past the International Memorial to the Detroit Riverwalk, past Cobo Center andJoe Louis Arena, and along Detroit’s riverfront. . . .” NABJ announced. · About 70 NABJ members saw a preview Saturday of the feature-length documentary “Sugar Town,” which debuted Monday on the Investigation Discovery channel. “Set in New Iberia, La., the show looks at the tension that arose in the racially divided town after the shooting death of 22-year-old Victor White III while in police custody,” the Los Angeles Times reported. Present were Rev. Victor White (father of the slain Victor White III) and radio talk show host Tony Brown. The film drew “a passionate crowd,” publicist Chelsye Burrows said. · Over a complimentary Thursday morning breakfast, “In conversation with Delece Smith-Barrow of the Hechinger Report, Jim Shelton, Head of Education at the Chan Zuckerberg Initiative [spoke] about the philanthropy’s work to make opportunity real for every child, especially those historically underserved, by providing educators with the tools and resources they need to prepare each child holistically — academically, physically, socially, and emotionally — for success,” according to an NABJ announcement. · The School of Global Journalism & Communication at Morgan State University created a website to showcase its students’ coverage of the convention.